Hello! I’m Kate Tinworth, Program Co-Chair of the DVRTIG. 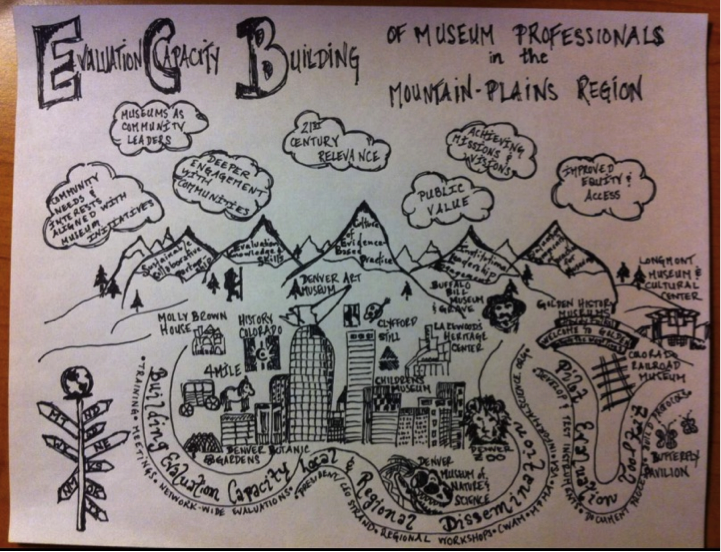 I am excited to write about one of my favorite parts of my work as an evaluator— drawing. Last year at AEA I co-presented a session called, “Drawing Them In: Graphic Facilitation & Evaluation to Strategically Visualize Change” with my friend Chris Chopyak (a rock star who literally wrote the book on using visuals to help businesses address challenges and create strategies). We reminded our audience that we all think visually, images are key to memory and learning, and that you—yes, you—can draw. And you should! Visuals can resolve ambiguity, cut across language and cultural divides, help findings become more salient, and kick start action. Hot Tip: Find a Local Friend. If you want to explore the potential of teaming with a graphic facilitator, it’s time to make some new friends. 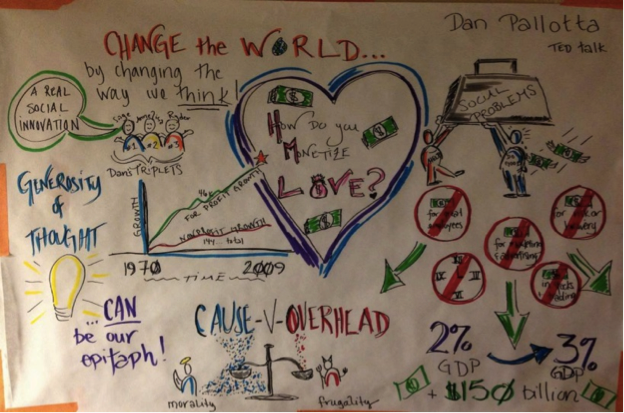 Check out the International Forum of Visual Practitioners (IFVP): http://ifvpcommunity.ning.com/. There’s bound to be someone near you! Rad Resource: Go to a Class/Workshop. There are great opportunities to try your hand at graphic facilitation, whether you plan to incorporate it into your evaluation practice or just want to stimulate your visual thinking. Though it can feel intimidating, I highly recommend signing up for a class. Learning graphic facilitation techniques have helped me to sketch out graph and chart ideas, think through report layouts, and get far more creative with methodology and instrumentation. Some graphic facilitation practitioners, including Chris, do “drink and draws” where you can get some drawing practice over a cocktail. Amazing! Hot Tip: Draw. All the Time. To become more comfortable with drawing I draw, all the time. Try covering your dining room/kitchen table with butcher paper and put crayons or colored pencils out. When you sit down for coffee or a meal, draw. Tape paper to the wall and “live capture” TED talks or your favorite podcasts. Carry a notebook and favorite pen everywhere. Commit to drawing for just 2 minutes a day. More of a techie? Draw on your tablet! I like Notability and iMotion. The DVRTIG is a great place to find inspiration and make connect with colleagues who care about visual thinking. Check out the AEA365 blog posts, the TIG website, and resources on p2i. Whenever you can, try to “go visual” in your projects. Try a visual logic model. Engage stakeholders in drawing. I often get my stakeholders to draw during a training or as I present preliminary data. Lately I have also been experimenting with data placemats, which I learned about through AEA (thanks @VeenaPankaj). First of all, your origami idea is amazing! I would love to see that in practice. Might I ask for a demo at AEA this fall if you will be there? I also think that would make a great session or blog post. What a lovely way to talk explore evaluation findings and communicate change. Love it! Like you, I have also used drawing in my non-evaluative work– specifically when helping museums and art organizations envision strategy. When working through a strategic plan or initiative, I have found drawing and visualization incredibly helpful in creating cohesion, common vocabulary, shared understanding, buy-in across traditional boundaries, and inertia towards next steps. If you haven’t yet, I highly recommend reading my friend Chris Chopyak’s book (referenced in the blog post above), called “Picture Your Strategy.” I have a feeling it will really resonate for you! I love this! I have tended towards this practice on my own, and I’m so happy to hear it is a sanctioned, professional skill. An evaluator colleague of mine have been practicing ‘drink and draws’ since last year’s AEA conference, and we love it. One is now posted on my wall as inspiration. I’d enjoy seeing a blog post about how to code graphics that were created as a data collection method. Thanks for your comment. I love knowing you’re out there also practicing your craft! We should definitely do a little Drink and Draw at AEA 2015 in Chicago. I also love you idea about a post on coding and interpreting graphics and visual data. I’d definitely be up for sharing some approaches I have honed and am continuing to develop. Thank you Kate for sharing this “arts-based” methodology. Can you tag this post for the “Art, Culture, and Audiences” as well? I use drawing all the time to map out spaces and interactions in my classroom observations. Providing drawing prompts for students with a follow-up interviews is a great way to see and understand aspects of a situation that a survey or observation might miss. I use it to diagram and figure out relationships and processes when organizing and analyzing data. And I use it as an additional- and often central- way to communicate findings. So pick up a pen, pencil, stylus, mouse, or other adaptive drawing device and get visual! So many great ideas in your comment. Thanks for sharing! Your work sounds like an amazing idea for a future AEA365 post. Might you write one on the topic? Also, since you and I are former Arts, Culture, and Audiences co-chairs I *of course* agree this post should be tagged with that as well, though it’s not something I am able to do. Hey AEA365 blog-masters– can you add that tag for us? Great post. Drawing is a powerful tool. I think facilitated art work is something that needs to be explored. It’s an underutilised methodology in evaluation, and it can make a big difference to facilitation. I have used this in a business analysis setting to facilitate drawing a conceptual solution to a business problem and it worked really well. However, I know if the same was applied to evaluation through facilitating theory of change, mapping needs assessment or even cartoonifying/storyboarding results it will make quite a big difference in how stakeholders understand and utilise evaluation findings. Keep posting, and thanks for the great links. I have also explored the idea of using origami to represent evaluation findings or lessons learnt. I think using origami figures as analogy and as a way to represent lessons learnt can help remind individuals of evaluation findings, the context in which they were found, and what needs to change.